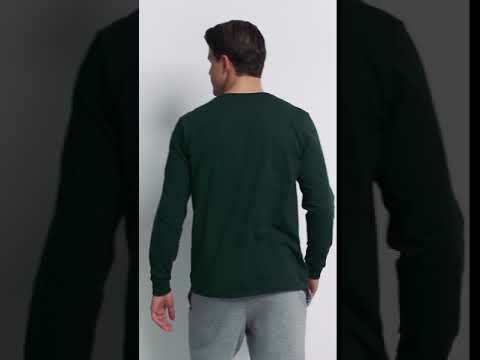 This long sleeve crewneck T-shirt will keep you dry as you sweat, making it easy to transition from work to workout. This tee features moisture-wicking fabric, odor protection, UPF 30+ protection, and soft spun yarn making this tee extra comfortable. It offers the comfort of cotton combined with the benefits of performance. The Russell Athletic® Men’s Long Sleeve Essential Tee delivers the comfort, style, and performance to fit your active lifestyle. This long sleeve T-shirt features our patented Dri-Power® moisture-wicking technology, odor protection to keep the fabric fresh, and a 30+ UPF rating to protect you from harmful UV rays. This tee is a wardrobe essential, offering both style and comfort.